Chellsie Memmel has been in a gym since the day she was born. In the beginning, you would find her hanging out over Mom or Dad’s back while they coached. As soon as she started walking she was taking Parent & Child portait of Chellsie MemmelClasses, then Tiny Tumblers on up. She competed compulsory levels from four to seven years of age and began optional gymnastics at age seven. Chellsie was a Tops National Team member from age six to nine. She became an elite at the age of 10. She really enjoys competing for the United States and traveling the world doing so. Some of the countries she has traveled to are: England, France, Belgium, Switzerland, Puerto Rico, Dominican Republic, China, Brazil, Greece and Australia. She attended school all the way through 2003. She then home schooled for a year so she could train and prepare for a spot on the Olympic Team. Two months before the Olympic Trials, she broke her foot and was denied the chance to compete at the Olympics. She was named as an alternate. Chellsie went right back into high school her junior year. Balancing training and school was difficult, but she did both very well, graduating with honors. In 2005, she became the #1 ranked gymnast in the world. She won the All-Around World Champion title and became the first American woman to win an All Around gold medal at World’s since 1994. Shannon Miller won in 1994 and Kim Zmeskal won the title in 1991. Chellsie was one of the 10 finalists for the Women’s Sports Foundation 2006 Sportswoman of the Year. She was also nominated twice for the prestigious AAU Sullivan Award in 2003 and 2005. It is known as the “Oscar of Sports Awards” it honors outstanding amateur athletes in the U.S that show the qualities of leadership, character, sportsmanship and strong moral character. She was part of the United States Olympic Committee’s 2003 USA Women’s Gymnastics Team of the Year and the United States Olympic Committee’s November 2003 Athlete of the Month. Chellsie was one of the 3 finalists for Gymnast of the Year by International Gymnast in 2003. 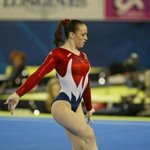 With all of these accomplishments, Chellsie has remained the same, a very humble, hard working, dedicated gymnast who loves to compete for her country.